1,001 SAT practice questions at your fingertips Setting your sights on college? Ready to take the SAT? 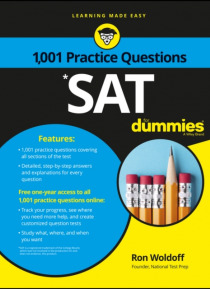 Get a head start on a high score with 1,001 SAT Practice Questions For Dummies. Inside, you'll find 1,001 practice questions on everything you'll encounter on the SAT. All of the question types and formats are here, so you can study, practice, and increase your chances of scoring higher on the bi… g day. Whether you're cramming on the go, pulling an all-nighter, or making useful time of study hall, 1,001 SAT Practice Questions For Dummies gives you the practice you need to prepare for that all-important exam day. So roll up your sleeves, put your nose to the grindstone, and get the confidence to perform your very best. Includes free, one-year access to practice questions online Offers 1,001 SAT practice questions from easy to hard Tracks your progress, so you can see where you need more help and create your own question sets Provides detailed, step-by-step answers and explanations for every question Approach the SAT with confidence. Everything you need to succeed is a page away.